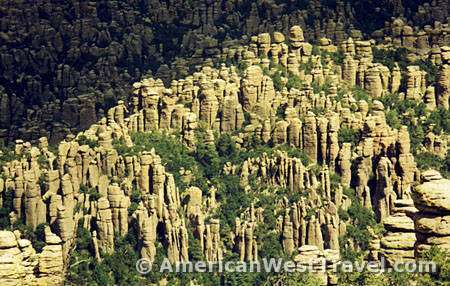 The Chiricahua Mountains and surrounding areas of far southeastern Arizona were once the homeland of the Chiricahua Apaches, led by Cochise and Geronimo. They took advantage of this rugged land which consists of high desert basins and abrupt mountain ranges - "sky islands" - to resist the pioneer settlement for more than 25 years. More than a century later, most of these mountains are within the Coronado National Forest, much of it unspoiled wilderness. 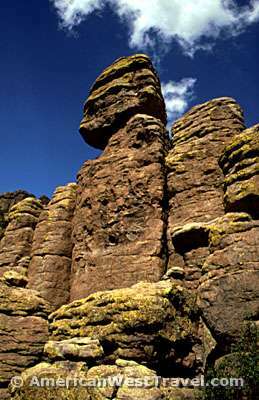 The unique northwest corner of the Chiricahua Mountains is designated as the Chiricahua National Monument. 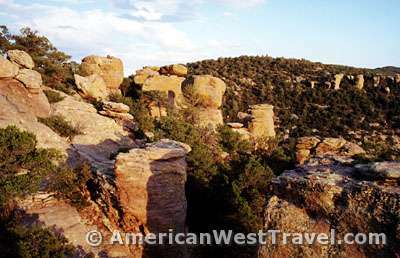 This region was known to the Apaches as the Land of Standing-Up Rocks. The pioneers called it the Wonderland of Rocks. Much of the monument is a maze of rock spires, hoo-doos, giant rock columns, and delicate balanced rocks. While much of this high country is semi-arid woodland consisting of juniper and pinyon pines, areas dense in rock formations appear as rugged badlands. A network of trails accesses these badlands and offer fascinating hiking. The origin of the rocks is thought to be a massive volcanic eruption about 27 million years ago. A 2,000 foot layer of white hot ash fused into rhyolite. Eons of exposure to the elements did the rest. The rhyolite's weak vertical and horizontal cracks were more susceptible to erosion thus creating these fanciful formations. 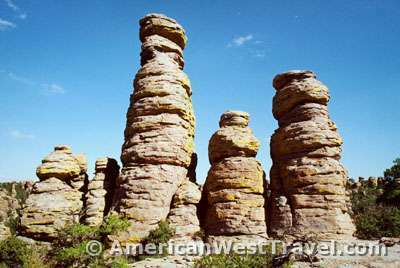 The Chiricahuas are many miles from the main highway. Visitation to the monument is relatively low, especially in the off seasons. The result is an area which is exceptionally unspoiled and exceptionally rich in wildlife. The campground (right) is located in the riparian area of lower Bonito Canyon near the base of the mountain. 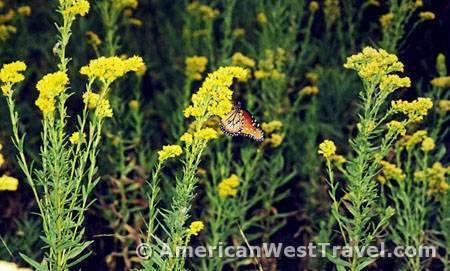 The canyon supports a heavy growth of oak and Arizona cypress as well as lush, grassy meadows. The bird population is exceptionally large and varied. 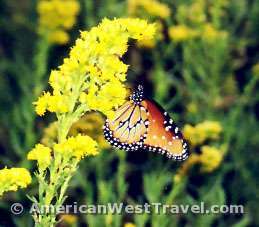 But more so is the incredible population of butterflies. The meadows were particularly rich with them - numerous varieties with many beautiful colors. I was fortunate to get one to pose for me as shown in photos left and right. Silver Spur Meadow was the site of a huge Civilian Conservation Corps (CCC) camp during the Depression. 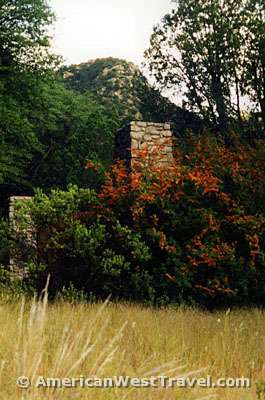 The men of the CCC built the facilities and trails here at the monument as they did at many of the national parks and monuments. All that remains today are two fireplaces with their stone chimneys (photo, left). Their large size is indicative of the large structures which once were in this field. The camps were run in a semi-military regimen, providing training, hard work, and purpose for thousands of young men during a very hard era. It also exposed them to the outdoor life. The work they did at the national parks and monuments could never be replicated today because the expense would be too great. It is therefore an important legacy to our country. 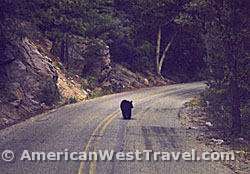 The wildlife of Bonito Canyon was much in evidence. A highlight of our visit was an encounter with a bear on the park road. This occured a half hour before sunset so sadly the lighting was poor. When the bear went back into the woods, I was able to get a much closer shot, but it was too dark, and the picture failed. This drought of this past summer in Arizona drove hungry and thirsty bears into closer contact with humans. 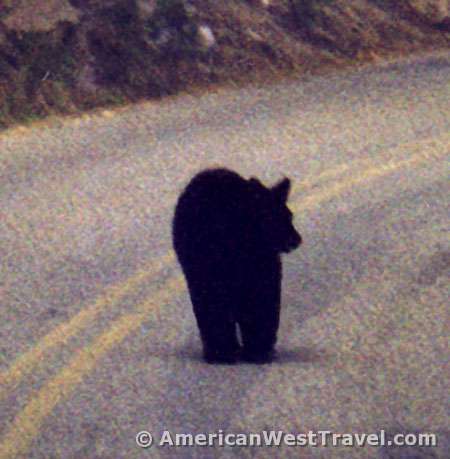 Unbelievably, several black bears were captured on the streets of Phoenix this summer! We asked the park ranger about this bear. Apparently it was a female with a cub in tow, and they had been frequenting the area around the campground but had not caused any trouble. The garbage cans in the campground are bear-proof and there are also food lockers. So the bears hadn't actually raided the campground. There were some pockets of water in Bonito Creek, and that could have been their goal. There were other mammals in the area. Gerry spotted a coatimundi near a waterhole. This raccoon-like creature is generally considered Central American, but mixing does occur here near the Mexican border. We spotted a deer near Massai Point (photo, left) just after sunset. During the night, I heard a jostling of our gear on the picnic table. Using my flashlight, I mesmerized a beautiful ring-tailed cat standing on my Coleman stove! This reclusive animal resembles a cat, but has a huge bushy tail like a fox, and the tail has black rings! 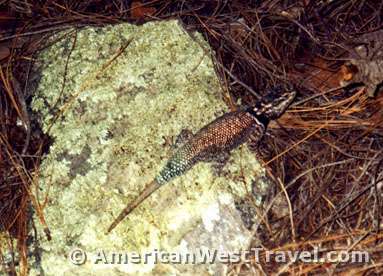 There were of course many lizards in the park as the region is semi-desert. The park also preserves some pioneer history. 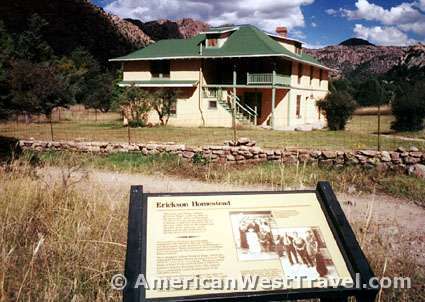 After Geronimo surrendered in 1886, one of the region's first homesteaders was the Erickson family, immigrants from Sweden. They built a ranch in Bonito Canyon. By the 1920's, daughter, Lillian Riggs, had developed the property into a guest ranch and named it the Faraway Ranch. The property was eventually absorbed into the national monument. Today, visitors may tour the grounds, and guided tours are conducted inside the well preserved main building. The most spectacular part of the park is known as the Heart of Rocks. It is accessible only by several hours of hearty hiking through a very unspoiled and very beautiful wilderness area. We invite you to join us on this hike which also includes a visit to the equally beautiful Echo Park. 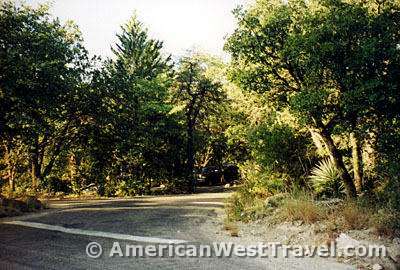 Proceed to Chiricahua National Monument - Hiking the Heart of Rocks.